This project is intended to provide cabin heat on those rare cold winter mornings here in Florida. It is now early spring and this project may take some time to complete, not because it is difficult, but because there is no rush. To a degree, this is a frivolous addition. The hot water connections on the fire wall are obvious to the casual observer and often draw comments about the lack of heat. In addition, occasionally, there is a cold morning when heat would be nice. So, I have yielded to the temptation having the "Hot Start Water Heater'. It seems ideally suited to this application. Several alternatives have been considered. One alternative is to replace the heater core with an electric core of approximately the same dimensions. This is the most efficient and most elegant, but also the most difficult. Instead, a water heater, used in the cold country to make starting easier after a cold northern winter night, was chosen. 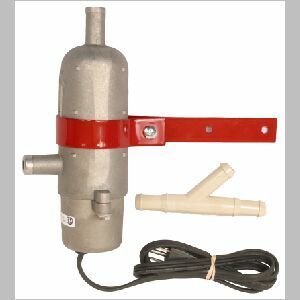 This unit plugs into a 110 volt outlet and is thermostatically controlled to circulator hot water through the engine block. 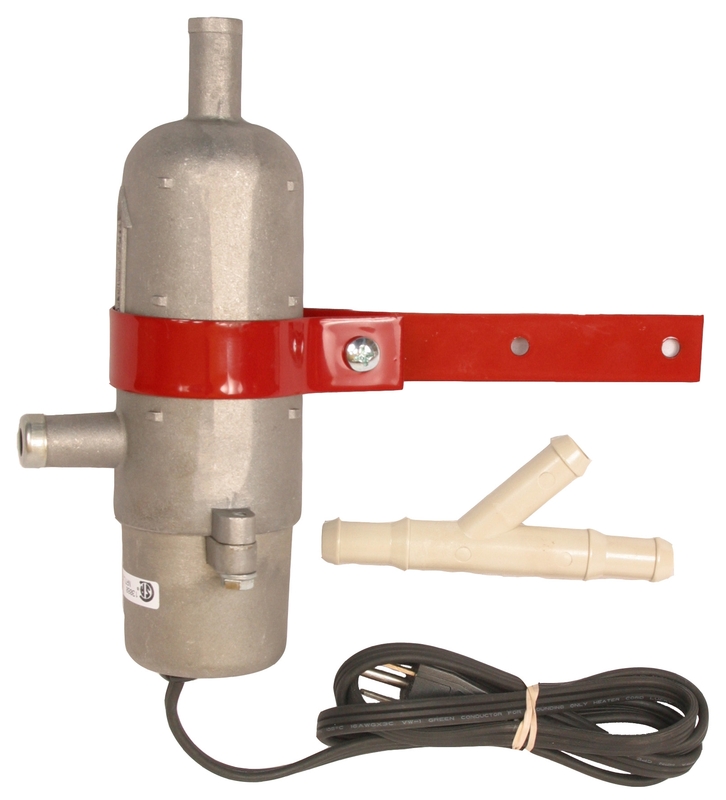 The Kats 850W 120V tank heater, is Made of die cast aluminum, 5' HPN 105 degrees C, Thermostatically controlled 135-175 degrees F, Strap type mounting, 7 Amps, Up to 18 quarts capacity cost me $33.99 at Amazon. 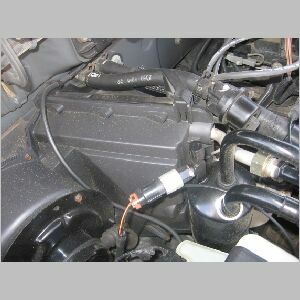 Above left is a picture of the heater hoses prior to removal of the V6 Engine. You can see the position of the Vacuum Operated Hot water flow Control at the top near the center. The plan is to reinstall this control inseries with the new water heater. In cold weather the heater will be plugged in. The heater will maintain hot water in the tank under thermostat control. The driver will control circulation, into the passenger compartment, using the existing dash control. Watch this spot for progress on the heater project.